Dual Gold Cup winner Kauto Star returned to his brilliant best to beat Long Run in the Betfair Chase at Haydock. The 2007 and 2009 Cheltenham winner jumped superbly to beat this year's Gold Cup victor by eight lengths. Kauto Star, who went off at 6-1 after a disappointing campaign last season, looked strong under Ruby Walsh. The 11-year-old crowd favourite battled to victory and was given a great reaction by the Haydock crowd. Before the race there had been speculation that a below-par performance by the Paul Nicholls-trained star could hasten his retirement. But he showed he is still a force to be reckoned with, putting aside the memories of his last race in Punchestown in May where he was pulled up, for one of the best displays of his career and a fourth win in the race. He held a narrow lead from Time For Rupert in the early stages and jumped impeccably, outjumping Long Run at several fences on the second circuit. Diamond Harry ran well for a long way but could not match the big two in the closing stages, while Time For Rupert and Weird Al could never get close enough. Kauto Star kept his jumping together and always had plenty in hand after the last to keep Long Run at bay. Nicholls, who was enjoying a big-race double after the success of dual Champion Chase winner Master Minded, also owned by Clive Smith, in the Amlin 1965 Chase at Ascot, said: "I'm speechless. That's the best day I've ever had. It's just amazing. "We'd left no stone unturned, I'd got him as fit as he ever had been. We'd always thought about trying to make the running today, but hadn't told anyone for obvious reasons, and it all went to plan. "Last year at home he always made a noise on the gallops and he wasn't finishing his races, but for some reason this year he's not making any noise at all. "He's great for racing, and I hope those that said he should have been retired will apologise." Winning rider Ruby Walsh said: "He's an amazing horse. Paul had him spot on. I was hoping there would be another big day in him so I'm glad now I'm here and not at Ascot. "I thought I'd take the bull by the horns and see how we get on. It's just a pleasure." Both Kauto Star and Master Minded could now be aimed at the King George VI Chase at Kempton Park on Boxing Day where they are likely to face Long Run. Long Run's trainer Nicky Henderson said of his charge: "He jumped great until a couple of errors crept in there, and all of a sudden he wasn't going as well as he should have been. But in fairness, he stayed on very well from there. "As I've just said to Robert [Waley-Cohen, owner], it's slightly like his first run last year. "He jumped very well, apart from a couple of silly errors - and we've got a run into him. "I'm delighted to see that horse [Kauto Star] back. It's going to make it all to play for now. "It's great for racing, just disappointing to get beaten obviously. But we've got time to get our own back." 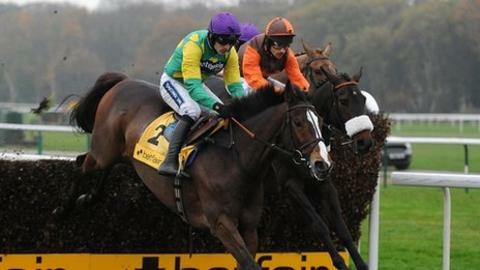 Read more on Is veteran Kauto ready to call time on a stellar career?